Welcome to our Greenhouse Sale! Backyard Greenhouses is pleased to announce our 2013 Greenhouse Summer Sale. 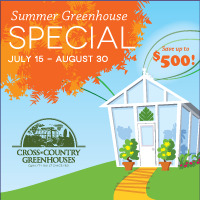 You can save up to $500 toward the purchase of a greenhouse when you order a greenhouse between July 15, 2013 and August 30, 2013. These savings apply to the price of the greenhouse only and not added accessories, shipping, customizations or applicable taxes. This discount does not apply to the Sun Garden Feature Greenhouse, Parkside Feature Greenhouse or the Legacy Feature Greenhouse. All greenhouses must be purchased between July 15, 2013 and August 30, 2013 to receive the above discounted pricing. This promotion is on the regular retail price of all greenhouses and not based on any sale pricing in effect.